Find a space for your child to grow through playful learning. Develop a routine for your preschooler. As a preschooler, your child is ready to learn. At Kidstown Learning Center in Lake Worth, we’ve created a fun space where your child can explore different areas of language, science, mathematics, music, art, and more. Our daily schedule and creative curriculum will help your child develop different routines that give them the skills necessary to tackle kindergarten. Kidstown Learning Center is the perfect place to help your child grow, so contact us to learn more about our programs or to enroll your child today. • A daily schedule that introduces your child to a routine. • Storytime and outside play in the morning and afternoon. • Break, lunch, and afternoon snacks provided daily. • An introduction to numbers, letters, shapes, and colors. • Development of fine and gross motor skills through the daily provided activities. For children ages 2-4, learning shouldn’t be difficult. 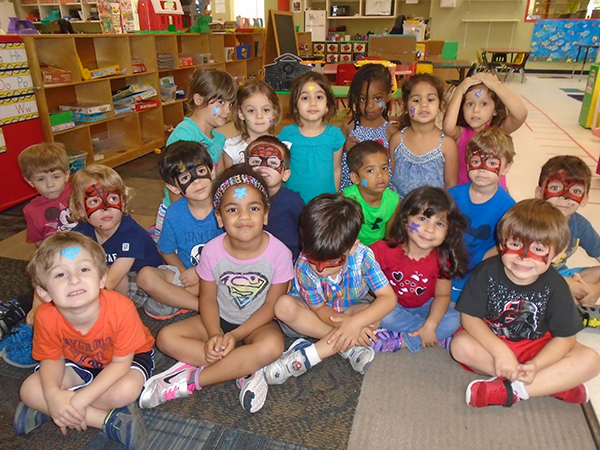 With the preschool programs offered by Kidstown Learning Center in Lake Worth, learning is made into a fun, exciting, all-inclusive experience. Our creative curriculum and class setup is well-planned and includes a rich variety of learning activities. The Creative Curriculum is a comprehensive, research-based course of study and fun which features exploration and discovery as a way of learning. Children explore language, science, mathematics, drama, music, art, reading, writing, cooking and more. Our preschool programs follow a daily schedule in order to help build familiarity and create a learning routine. Teachers will interact will children in their classroom throughout the day, and in their daily schedule they will have a circle time where they will review their weekly lesson plan. The children in our preschool programs also have story time and outside play in the morning and in the afternoon. Breakfast will be served from 7:30 to 8:30 in the morning, lunch at 11:30 a.m. and afternoon snack at 3 p.m. These two meals and the snack are included in your weekly tuition. Our preschool child care programs will introduce your kids to numbers, letters, shapes, colors. Their fine and gross motors skills are developed every day through their daily activities. The teacher will make sure they feel loved and secure to strength their development. Our preschool daycare center is located right next to Manatee Elementary School, in the Lake Charleston community. We serve the areas of west Lake Worth, Green acres, Wellington and Boynton Beach. Contact us to learn more about our preschool programs and see why Kidstown is the perfect place for your child to learn and grow! Want To Talk More About Preschool Care?